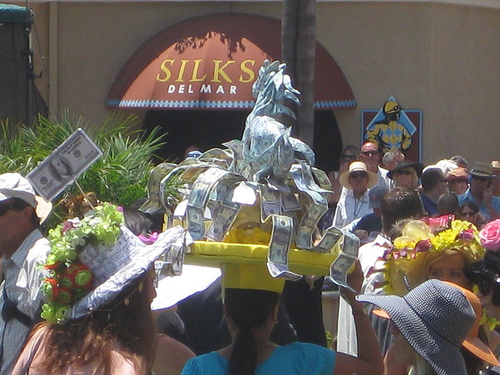 “Where the turf meets the surf” is the tag-line for the local Del Mar Race Track. This past week was opening day and as tradition goes, they have a hat contest with some pretty unique (and outrageous) entries. I have no desire to watch horses (or any animal) race but it’s a unique San Diego event and a nice place for a summer afternoon. For those with alternate interests Comic-Con is going on in my fair city this weekend. “Why can’t everybody just get along” seems to the quest of the Amateur Financier as he discusses the the truth about politics. Deliver Away Debt continues the series on the Debt Destroyer by recommending capturing daily expenses. There’s a lot of good information in this post to help you get on budget. Remember when Tom Cruise went crazy a few years ago and a lot of us people never thought of him in the same way since? His antics are mild compared to the new Hollywood bad boy. Single Mom, Rich Mom shares how Mel Gibson blows it…money that is! Moolanomy shares what we can learn from Santa on saving and giving great gifts. It’s never too early to plan! Sometimes it’s good to have a refresher and that’s what this list of 9 key financial terms from Money Green Life does. Can you explain what APR means? Out of Debt Again lost some photos on her digital camera. She shares how you can retrieve deleted photos with a card recovery program. I need this! Are you making the right moves for retirement? Use these 5 ways to prepare for a successful retirement from Christian Personal Finance. Personal Finance Journey recalls one of my favorite shows as a kid. Learn from the financial profiles of Alvin and the Chipmunks. ALVIN!!!! I’ve shared my experiences with daily deal sites, but this article from Little House in the Valley includes online deal sites I didn’t even know about. Financial Samurai shares that senior workers outnumber teenage workers for the first time. What an amazing stat. Enjoy the discussion and analysis in the comments. Thanks for the link mention! Thanks for mentioning my post about the Card Recovery software. You’re welcome. I think it ‘s a great thing I didn’t know existed before. Previous post: Does Frugality Lead to Happiness?